You kids, beginning cooks and new cooks can prepare this simple to make, homemade, healthy Sweet & Sour Pork with Pineapple Stir Fry. Please join Manfreed every Saturday at 6:00 pm Eastern/3:00 pm in the West of North America free on Manfreed’s web site home page. And please enjoy more delicious, easy to make, healthy stir fry here on Manfreed’s cooking web site. 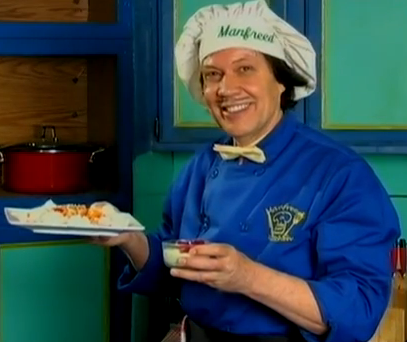 Manfreed demonstrates preparing an easy to make, quick, delicious, nutritious, homemade healthy Sweet & Sour Pork & Pineapple Stir Fry with a simple, very tasty Yogurt and Berries Dessert. Is it possible to put the whole recipe with the quantity of ingrédients and instruction on your webpage ? especially for this recipe and the others too (homemade, Sweet & Sour Pork & Pineapple) I would like to make this one but how, without the instruction ?? ?